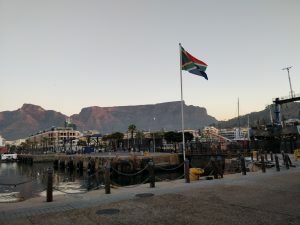 mySociety’s Head of Research, Rebecca Rumbul, gives an overview of our research work in the latest publication from the World Bank’s Open Knowledge Repository. Also featured is an experiment in citizen engagement from Mzalendo in Kenya, that was first shared at TICTeC. 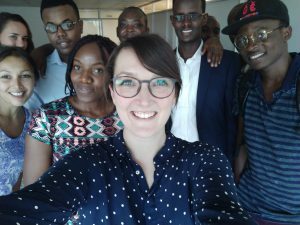 Evaluating Digital Citizen Engagement: A Practical Guide is a handy collection of examples and lessons from practitioners in Brazil, Uganda, Cameroon and Kenya, on how to measure the impact of civic technologies. Rebecca explains the methods we’re currently using to answer questions like, “are institutions equally responsive to citizens?” and, crucially, “are our tools genuinely making a difference?”. Meanwhile, Lily L. Tsai and Leah Rosenzweig, who contributed last year to our Impacts of Civic Technologies conference TICTeC, give an overview of how they used Facebook ads to draw conclusions about what makes people take concrete political actions online. You can download the guide for free here — and don’t forget, if you’d like to hear more about the ways in which civic tech’s impact is being tested by projects around the world, there are still a few tickets available for TICTeC 2016. For verified, reliable information, it’s usually best to go to the official source — but here’s an exception. 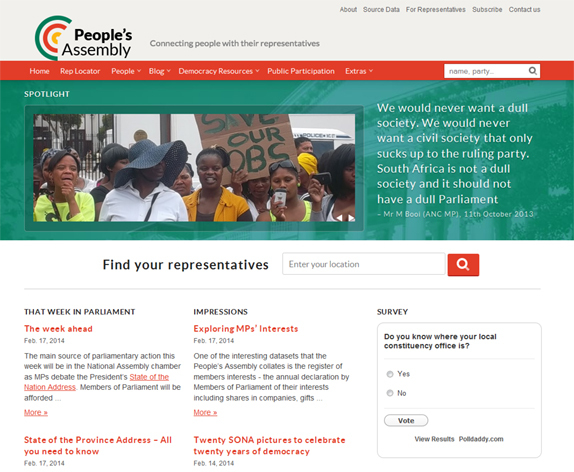 Parliamentary monitoring website Mzalendo, which runs on mySociety’s Pombola platform, carries more accurate MP data than the official Kenyan Parliament site. 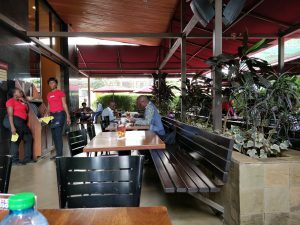 Checking parliament.go.ke‘s list of MPs against Mzalendo’s, our developers discovered a large number of constituency mismatches. These, explained Jessica Musila from Mzalendo, came about because the official site has not reflected boundary changes made in 2013. Even more significantly, the official parliament site currently only holds details of 173 of the National Assembly’s 349 MPs. 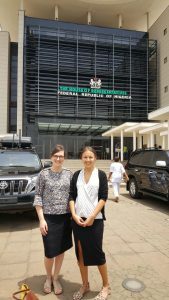 “The gaps in www.parliament.go.ke validate Mzalendo’s very existence,” said Jessica. We agree: it’s a great example of the sometimes unexpected needs filled by parliamentary monitoring websites. And of course, through EveryPolitician, we’re working to make sure that every parliamentary monitoring website can access a good, reliable source of data. 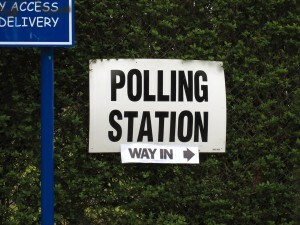 Right about now you may be considering whether you’ll be voting your MP back into Parliament in the coming election. Has he or she reflected your interests? One key way of checking that is to look at their voting record. 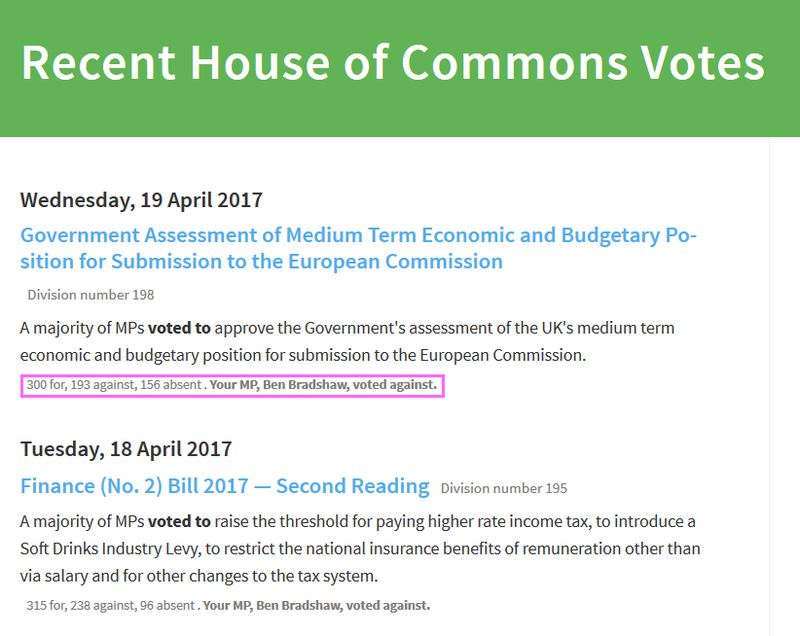 We’d like everyone to know exactly how their MP voted over the last parliament, so we’ve made some changes to TheyWorkForYou that make votes easier to understand. See an example here, or read on to find out how to check your own MP’s voting record. 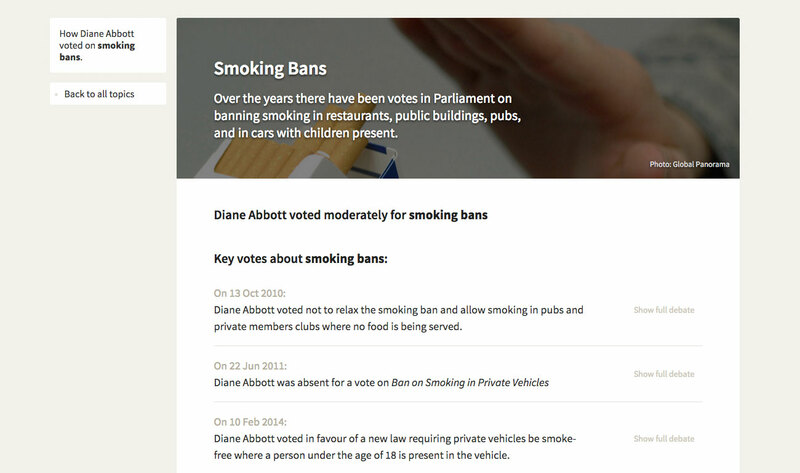 TheyWorkForYou publishes activity from Parliament each day. This content includes parliamentary votes, along with the debates that they are part of. But it’s not always obvious to the lay reader exactly what’s being voted on. – you may well be lost. And who would blame you? We don’t think you should have to be an expert to check your own MP’s voting record, and our new pages for each voting stance are here to help. 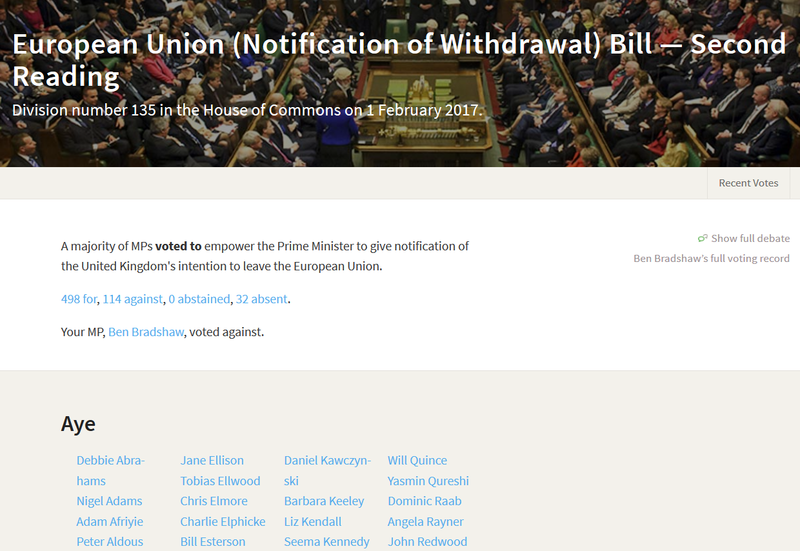 For some time now we’ve given you summaries of how your MP voted on certain topics, with a link to the votes that helped us understand each MP’s position on that stance. Now we’ve created a page for each stance, and worded it in plain English so that anyone can understand exactly what it means. Go to TheyWorkForYou.com and input your postcode on the homepage. You’ll be taken to the page of your (former) MP. Click on the ‘voting record’ tab. Choose a topic you’re interested in, and click the ‘Details’ link on the far right. You’ll see a plain English description of the stance, followed by descriptions of all the votes that were considered to contribute to it. Want to see the context? Click on ‘show full debate’ and you’ll be taken to the full record of that vote. 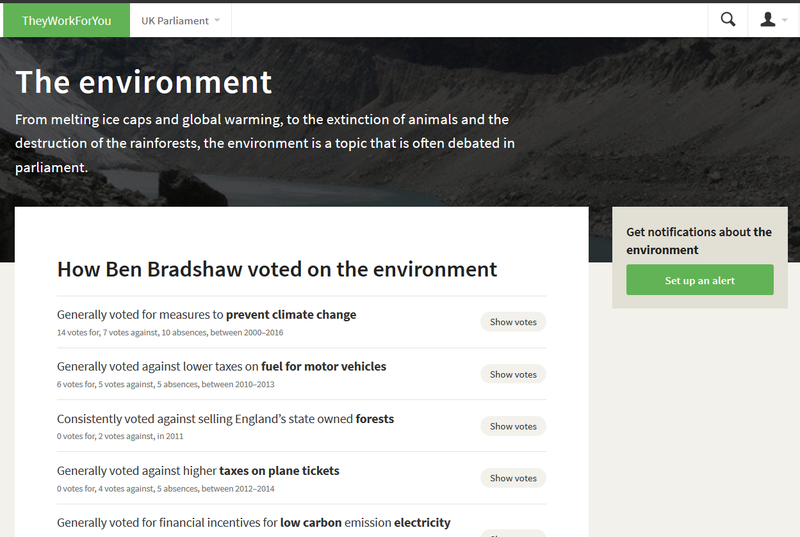 These pages are still a work in progress, so we’ve included a feedback box at the top of each voting stance page. Do be sure to let us know if there’s anything else you’d like to see on them. If you have feedback about how your MP has voted, mind you, that’s another matter… one you might want to reflect at the ballot box.